It is nice to be able to blog about sport at the same time as aviation. The mighty Auckland Warriors have made the NRL Grand Final for only the second time in their 16 season history. At the same time their National Youth League Toyota Cup team have made back to back Grand Finals, heading in this time as defending premiers, and in an unparalleled feat the Warriors feeder team the Auckland Vulcans have made the Grand Final in the NSW Cup. So to get all the fans across the tasman for Sundays games the major airlines have added additional flights/capacity. Air New Zealand have added an additional Boeing 747 flight from Auckland to Sydney which sold out within 6 minutes! This is in addition to the first they sold on Sunday through their Grab-A-Seat website, which sold the flights, tickets etc in a single package. Qantas have added two additional Boeing 737-400 flights which still have a few selected seats available. In a move that is likely to cause disruption for the busy Grand Finals weekend in both AFL & NRL as well as school holidays, TWU workers will walk off the job on both Thursday and Friday this week. A smaller two-hour stop work by 50 TWU delegates will take place on Thursday, while 3,800 baggage handlers, ground staff and other Qantas employees will strike for an hour on Friday. This comes on top of the stop work action being carried out by Customs staff today. Air NZ paid A$32.8 million, or 29.7 cents per share, to lift its stake 5 percentage points to 19.99 per cent, according to a substantial shareholder notice lodged on the ASX. The announcement has Air New Zealand now sitting on the takeover threshold, although CEO Rob Fyfe says they have no plans to mount a takeover bid. Air New Zealand is yet to seek board representation as part of the deal although it is expected that this will happen. Virgin Australia shares rose 3.3c in trading yesterday, in response to the announcement, bucking the trend of the ASX. Queenstown has had a big win from the announcement by Jetstar with additional flights from Melbourne and new flights from Wellington and Sydney. Jetstar's new Sydney-Queenstown return flights will run twice weekly from 23 December. The airline is planning the flights for Monday and Friday mornings, which is a welcome addition since there are no existing flights on Mondays. Although not announced it looks like these flight will replace the current Monday and Friday morning flights from the Gold Coast to Queenstown. Jetstar is selling limited $7 fares today to promote its new Wellington-to-Queenstown route in a bid to further breach Air New Zealand's hold on the domestic market. The NZ Herald also report that Auckland-Queenstown flights will be increased. Virgin Australia and Delta Airlines have announced the code shares they will begin their trans pacific partnership with. The flights are available for sale from today, and will commence from Sunday 06-November-2011. Velocity frequent flyers will be able to earn full frequent flyer miles on Delta's trans-Pacific flights from Sydney to LAX airport, and will also have access to Delta's Sky Club lounges. Reciprocal arrangements are also in place for Delta's passengers. But in even better news, V Australia's arriving flights will move from the awful Tom Bradley International Terminal (TBIT) at LAX, and will instead arrive at Delta's Terminal 5. Delta will codeshare on V Australia flights to/from LAX-BNE/SYD/MEL with Virgin codesharing on Delta's SYD-LAX route. Qantas passengers look set to suffer as Qantas are forced to cancel 28 flights and delay a further 27 tomorrow due to industrial action. The Transport Workers Union (TWU) is striking as are Sydney based ALAEA engineers. 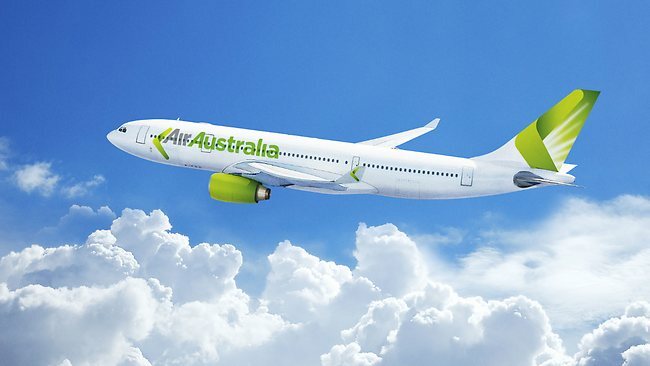 The Australian airline said despite minimising the expected impact of the strike by using larger wide-body aircraft and deploying management staff to operational roles it has been forced to cancel 28 flights tomorrow and delay a further 27 by up to 35 minutes. Tiger Airways have announced the appointment of former Virgin COO Andrew David as their new CEO of Australian Operations replacing Tony Davis. Flying in the face of the general trend of fewer passenger numbers and lower yields on routes to and from CHC, AirAsiaX have reported higher than expected loadings for the first three months of operation. AirAsia X chief executive Azran Osman-Rani said the airline was pleased with its first three months of operations in Christchurch and that forward loads were building well. "Our loads for the period April to June were consistently above 80 per cent, higher than forecast, and we're starting to see an improvement in yield. There is inbound demand to New Zealand not only from Malaysia but from a number of our connecting markets including Thailand, India, Britain and France," Osman-Rani said. Things are promising for the airline that launched it services after the second devastating earthquake on February 22nd. And while the airline is committed to CHC for 2years they have yet to announce if they will increase flights from 4x weekly to either 6 or 7x, and if they will make the routing permanent. Fair Work Australia (FWA) have rejected the claim from Qantas Pilots (AIPA) that Qantas' New Zealand subsidiary Jetconnect is a sham set up to undercut wages and conditions. The Australian International Pilots Association had been hoping a favourable decision would bolster their campaign to get all pilots flying Qantas planes operating under the same award. The ACTU also joined the test case, which had the potential to affect other Australian companies operating overseas. The ruling also found that AIPA was unable to represent the Jetconnect Pilots. "New Zealanders living and working in New Zealand for a New Zealand company should be subject to New Zealand's industrial laws and agreements and not to Australia's industrial laws," Ms Wirth said. 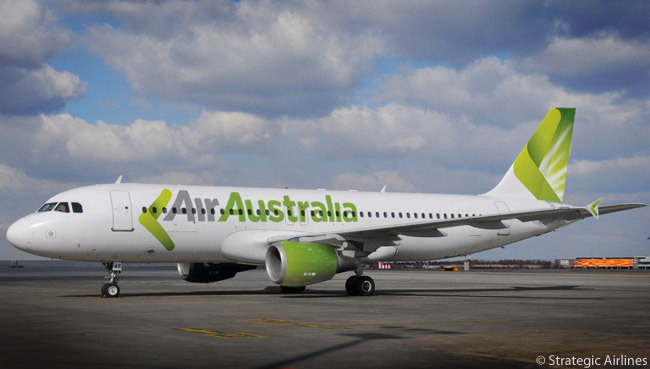 Strategic Airlines have revealed their new Air Australia livery at a staff event last night. The livery designed by Sean Cummings is designed as a "breath of fresh air" in the industry. The livery will be launched on one A330, when Strategic move to its new low cost model on October 30th. The livery is designed to roll out over the airline's other A330 and A320 aircraft and also to be reflected in uniforms and other customer "touch points".